Rivers flood, some more regularly than others. The more infrastructure humans construct in floodplains, the more vulnerable to extreme hydrological events they become. Thus, when Danube floods hit Vienna, a Habsburg residence and the most important city of the monarchy, its waters regularly swept over lower parts of the city center and its expanding suburbs. High floods, such as the Allerheiligengieß in 1787 or the great flood of 1847, arrived without warning. They caused massive damage to urban infrastructure and shocked residents. Protection measures, such as dykes, were destroyed and washed away by the force of the swollen river. During the most intense floods of the eighteenth and nineteenth centuries, city dwellers time and again had to retreat to their rooftops to save their lives, as reported in contemporary media. Telegrams were commonly used to send flood warnings. In the Viennese k.k. Telegrafen-Centrale flood warnings arrived from upper stretches of the Danube. The introduction of telegraph networks that spread across a large part of the Habsburg Empire promised to lessen threats posed by Danube floods. In 1849 the first telegraph lines were installed along the course of the Danube, connecting upper Austria to Vienna. Telegrams were then used to send flood warnings from the upper stretches downstream to the capital city, where the k.k. 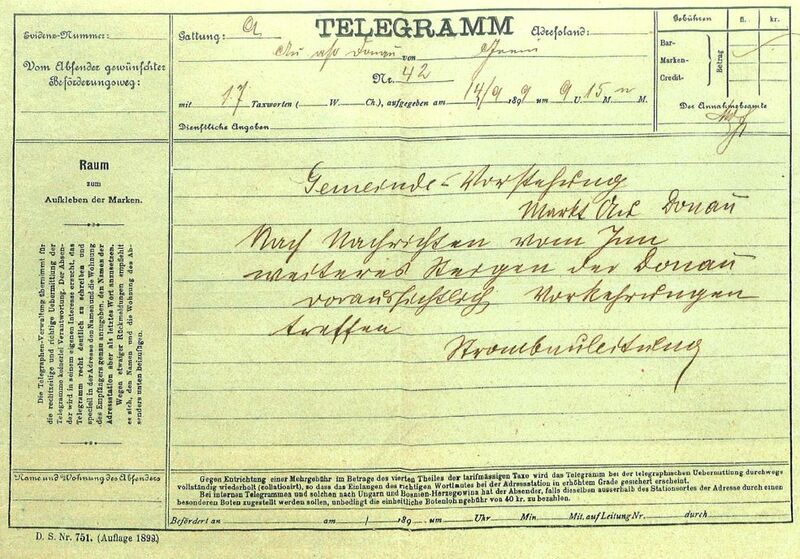 Telegrafen-Centrale subsequently disseminated the warning to city dwellers. In January 1850, an ice-induced flooding was reported near Linz, in northern Austria. 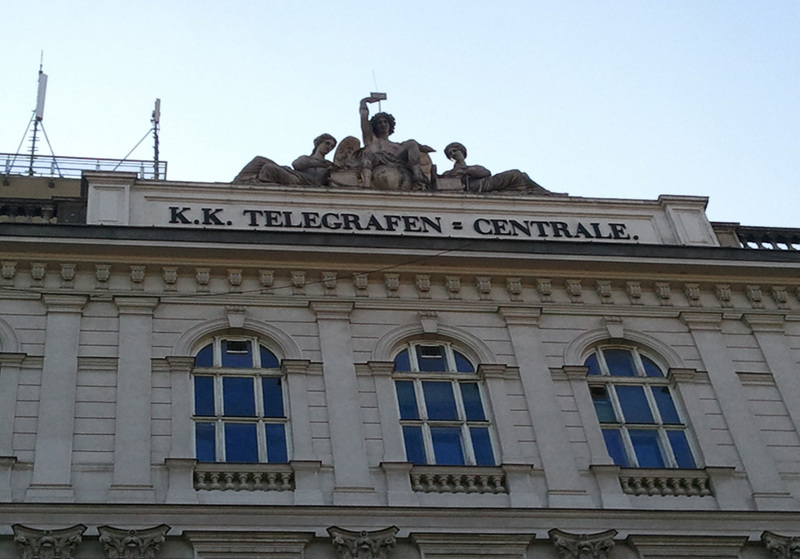 Immediately, telegraphs were used to inform Habsburg authorities that the flood was expected to hit Vienna two days later, giving the city time to prepare. 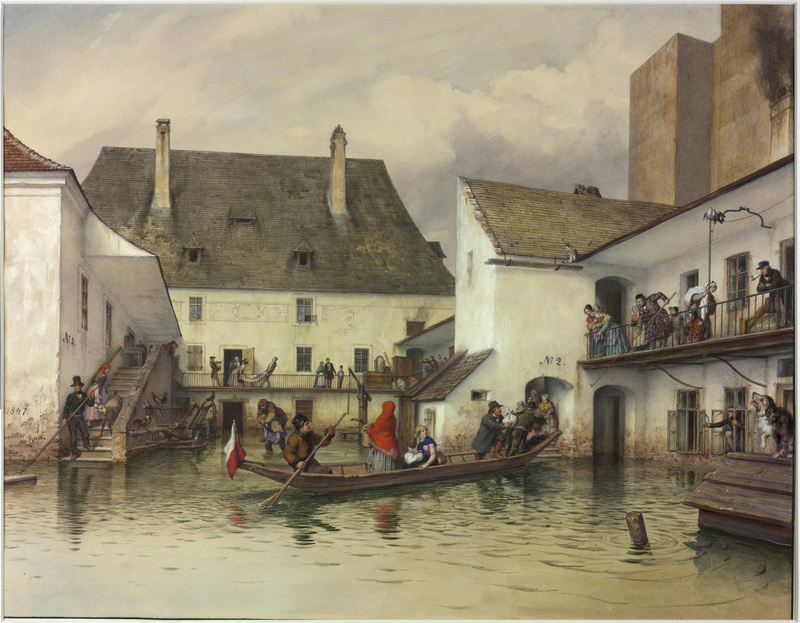 Viennese residents were no longer at the mercy of the river, as they had learned to gain advance knowledge of its behavior, if not to physically control it. Telecommunication would prove to be a powerful agent of change, and its role in helping people to deal with changes in nature should not be forgotten. Neundlinger, Michael. “Disaster Ahead: How Danube Floods Created Telegraph Networks.” Environment & Society Portal, Arcadia (2012), no. 7. Rachel Carson Center for Environment and Society. https://doi.org/10.5282/rcc/3747. Hohensinner, Severin, Haidvogl, Gertrud, Jungwirth, Mathias, Muhar, Susanne, Preis, Sabine and Stefan Schmutz, „Historical Analysis of Habitat Turnover and Age Distributions as a Reference for Restoration of Austrian Danube Floodplains“, River Basin Management 85, 3 (2005): 489-502. Schmid, Martin. "Die Donau als sozionaturaler Schauplatz: Ein konzeptueller Entwurf für umwelthistorische Studien in der Frühen Neuzeit." In Die Natur ist überall bei uns. Mensch und Natur in der Frühen Neuzeit, edited by Sophie Suppel and Aline Steinbrecher, 59–79. Basel: Chronos: 2009. Schmid, Martin, Verena Winiwarter, and Gertrud Haidvogl. "Legacies from the past: The Danube's riverine landscapes as socio-natural sites." Danube News 21 (June 2010): 2–5. Schmid, Martin, and Verena Winiwarter, eds. Umwelt Donau. Eine andere Geschichte. Published in conjunction with the exhibition of the same name, organised by the Niederösterreichisches Landesarchiv and shown at the Pfarrhof in Ardagger Markt. St. Pölten: Niederösterreichisches Landesarchiv, 2010. Michael Neundlinger studied social anthropology and history at the University of Vienna. In 2010 he completed his MA in Social Ecology and Environmental History at the University of Klagenfurt. Currently, Neundlinger is interested in the Environmental History of the Danube, Urban Environmental History of Vienna and city-river-relations in Early Modern Times.